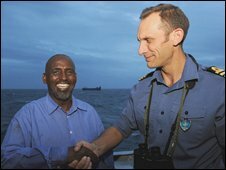 The master of a cargo ship which sank off Somalia following a cyclone has praised the crew of a Devon-based frigate for saving his men's lives. Capt Hassan Madar's vessel, MV Dubai Moon, sent out a distress signal which was picked up by HMS Chatham 175 miles (282km) away on Thursday. The Royal Navy vessel, which is conducting Nato anti-piracy operations in the area, raced to help. Capt Madar said he and his crew owed their lives to the Royal Navy and Nato. The Ethiopian master of MV Dubai Moon added: "Normally we operate close to the coast but we had to go far out to sea to avoid pirates - that meant we could not find shelter from the storm. "If we had not been rescued by the Royal Navy and Nato we would have died with my ship. "They were the only people to respond to our distress call; we owe them our lives." 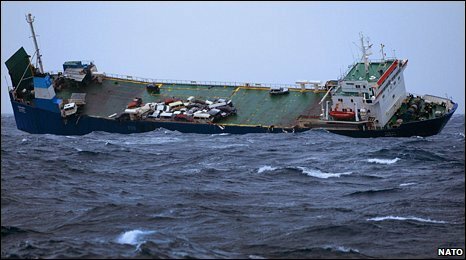 The cargo vessel, which was transporting vehicles, had begun to list badly after getting caught in a tropical storm which later developed into a cyclone. It was struggling to make headway in extremely rough seas and high winds and was drifting towards an island - raising concerns that it could run aground on a reef. HMS Chatham's commanding officer, Commander Simon Huntington, maintained contact throughout the night to try to work out the best way to save the merchant ship. When weather conditions improved on Friday, the crew of HMS Chatham were able to launch their Lynx helicopter to winch the 23 crewmen off the stricken vessel, which later sank. 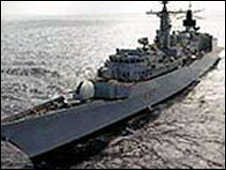 Commander Huntington said that when HMS Chatham received the distress signal the ship was caught in quite a fierce storm. "Clearly there was a question of lives being in danger and so there was no hesitation in my mind of what we needed to do," he said. "As we got closer to the eye of the storm and we approached the position of the Dubai Moon it became quite intense - winds of up to 70mph (113km/h) and quite towering seas. "It was not just the wind and the sea state, the visibility was incredibly poor too as we were experiencing torrential rain that you would expect with the monsoon conditions we were in." He added that the rescue operation to winch the crew onto HMS Chatham took three hours and that the cargo ship's deck, which was rolling up to 40 degrees, was covered in oil from the cargo of cars which had shifted during the cyclone. "This rescue was conducted in the most challenging sea conditions imaginable... the tropical cyclone tested the ship and everyone on board," he said. HMS Chatham, which is based in Devonport, Plymouth, has been involved in a number of rescue operations while carrying out operations in the Gulf. In February crew airlifted a Filipino sailor with suspected appendicitis to hospital after he fell ill on an oil tanker in the Middle East. A week before it had dispatched Royal Marines to help 21 Yemeni fishermen spotted adrift in the middle of a shipping zone after their vessel had run out of fuel.